I always wondered what lay at the end of Thiel Creek Road, also known as 98th Street, the road I take to my house in South Beach. I had heard rumors that you could drive all the way to the city of Toledo, Oregon on it. A couple times I started out on it, but in those days I had more of a city car. When the road turned to gravel and then got so narrow I feared I would soon run out of room, I chickened out. I also kind of feared to meet the villains from “Deliverance,” if you remember that movie. But I have a sturdy four-wheel drive now, and since I have become a widow, I am more daring. In the face of recent events, every other challenge seems pretty small. So, one grouchy day last week, after a mid-day post office run, I turned onto 98th Street from Highway 101 and thought: Why not drive that road all the way to the end? The weather was great, and I had no reason to hurry home. The road comes to a V just past Cedar Street. The north portion goes uphill into the sun, and the south branch goes down into the trees. I took the latter, a damp and shady road. To my amazement, as soon as I left the paved portion, a bear ran across the road in front of me. Although I have heard many tales of bear sightings, I had never actually seen one here. This black bear was on the small side, streaking across the road and disappearing into the bushes, not far from where my dog Annie and I walk several times a week. I stopped the car, my heart pounding. “I saw a bear! I saw a bear!” Thank God I was in my car and not on foot. Well, that turned my bum day around. Excited by my bear sighting, I drove on. The road was narrow and mostly gravel. I passed the deserted blue house where Annie and her siblings were born. Beyond that, the road narrowed and the trees closed in. Ferns filled the roadside among the spruce and Douglas firs.Thiel Creek gurgled through marshland. Milepost 1. I passed another house, then a for-sale sign and a big clearing with a bulldozer parked on it. More houses were hidden among the trees, one with a white goat in the front yard, but much of the road was unoccupied. On the right (south), a vast green area opened up. The road rose higher. I could see another road heading south down below but it was blocked by a gate and one of many no-trespassing signs. Milepost 2. Although the road was already so narrow I didn’t know what I’d do if another car came, a sign warned of a “one lane road” up ahead. Narrower, wetter, darker. Time to turn around, I thought, not wanting to chicken out again, but not wanting to get stuck either. Suddenly the road took a big curve north and I ended up on someone’s property. Thiel Creek Road ended at the front door of a massive blue house. Definitely the end of the road. If it ever went to Toledo, it didn’t now. The road was riddled with private property signs, but I had thought they meant the areas to the sides. On the way back, I saw a blue gate that I had missed the first time. Oops. I really was trespassing. 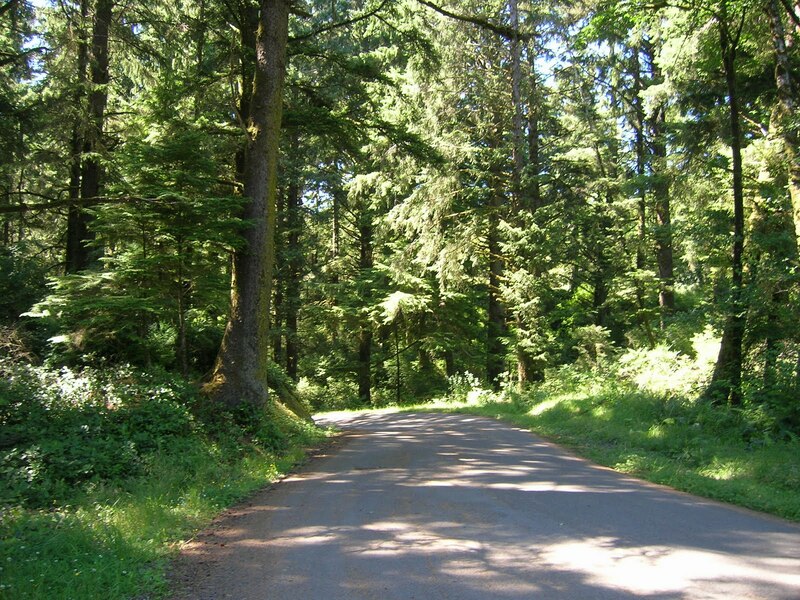 I turned around and bumbled along the gravel road toward home, happy in my adventure, seeing a bear and making it to the end of Thiel Creek Road.